There is this thing in America which begins earlier every year and is increasing in strength and ferocity. We call it “Black Friday”. Immediately after giving thanks for everything in our lives, we either take off after the evening meal, or wake up at the crack of dawn to join thousands of other Americans to go shopping. I tried it once years ago – there was no place to park, crowds in stores were elbow-to-elbow, and to top it all off, the prices were not good! So, I decided then – never again. Delightedly, this year I learned of a new tradition called #optoutside. 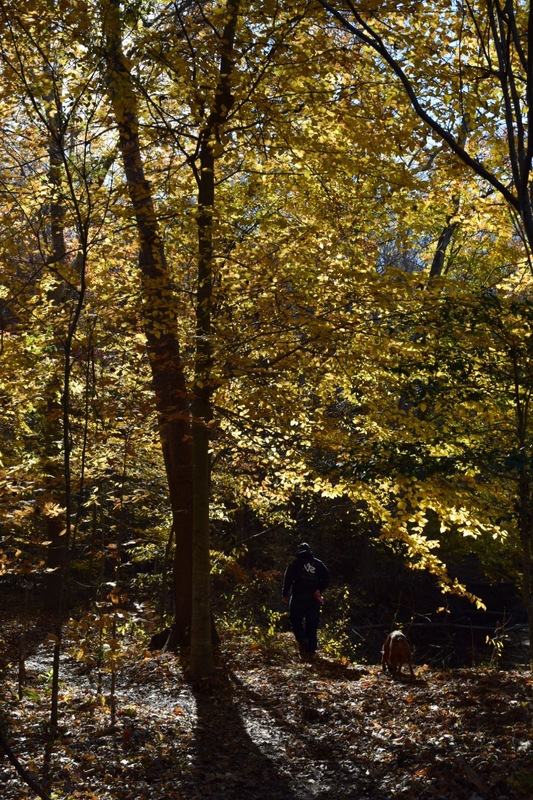 Instead of heading in to a store for shopping, or sitting on your couch watching tv, thousands of Americans decided to opt outside for some time in nature. We pulled up the google maps, located some new trails, and then headed out. Our trail selections were just about 2 miles from each other but about as different as night and day. Our first stop was at Spring Creek Bluffs. We parked in a small gravel lot, leashed up our hound dog and took off. The trail started in some scrubby woods and quickly we found ourselves in a high bank overlooking Spring Creek. Chas found a log that had fallen across the Creek creating a natural bridge and walked across it with Desi. It was mid-afternoon and the light glowed through the colorful leaves creating a scenery that looked a bit like the stained glass of European cathedrals. The slope quickly climbed steeply to the peak of the Bluffs and as we reached the crest we met some folks who spoke with an English accent turning back because they thought the trail had ended. We enjoyed the view for a bit before continuing on. Good thing we continued because the trail became even more breathtaking as we followed the ridge and meandered down to a greenway that bordered a neighborhood. We met a runner who jogged by with ragged breaths and a haggard expression on his face. Boy, I know that feeling, I thought. After a few hundred yards we turned back on to our trail to loop back to the beginning. A short distance later we rejoined the path and walked along the ridge and down the slope before winding up on a surprisingly long boardwalk. The place must be swampy in the summer time. At the end of the path we found a beautiful placard engraved with this poem. Nice inspiration on our day opting out in nature. 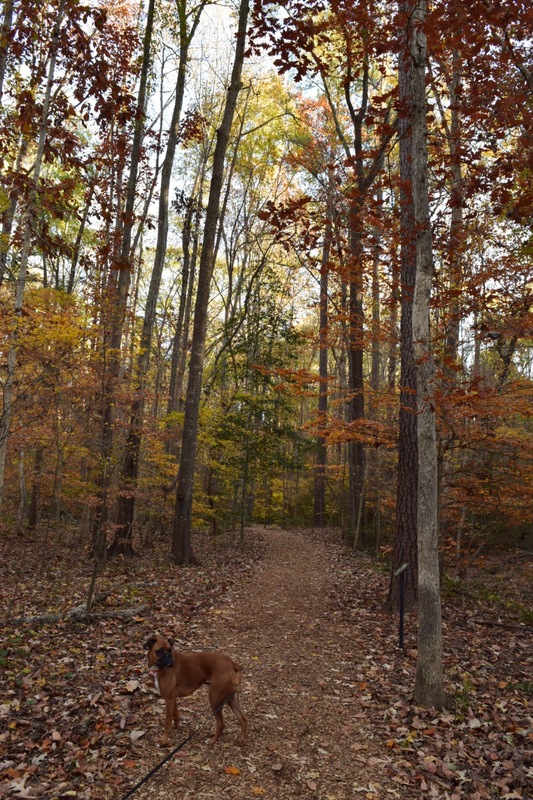 After completing this trail, we drove the short distance to Hemlock Bluffs – a nature preserve that had a beautiful nature center and what turned out to be very well-developed chip bark trails. Such a contrast to our first trail experience of the day. At Spring Creek Bluffs we saw maybe 10 people and one dog. Here groups of families, many with happy hounds tugging at the end of a leash, strolled along together enjoying the fine fall weather. Because we were still traveling the same bluff (I had assumed), I expected the scenery to be the same. As it turned out that couldn’t be farther from the truth. This park hosts a rare grove of Hemlock trees – a type of evergreen that is normally found in the mountains of western North Carolina – that thrives here because of a unique cold and swampy microclimate. 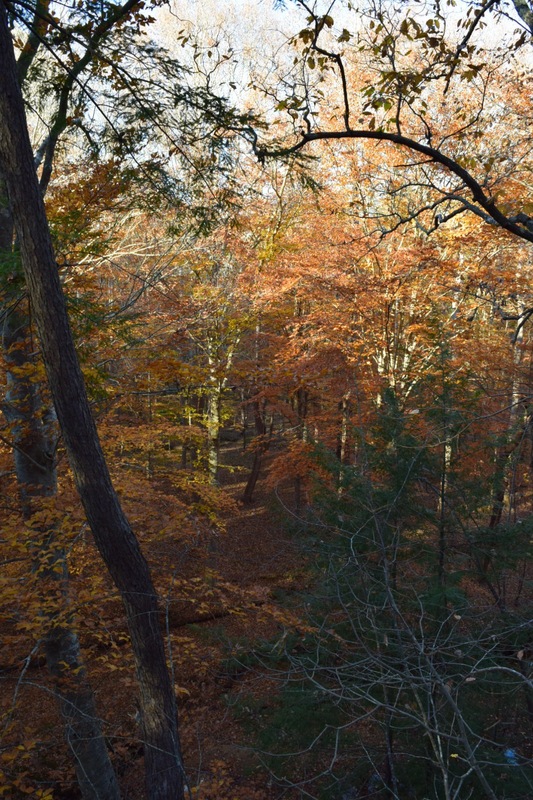 The preserve also has a large population of beech trees and what blew me away was the color of their leaves. 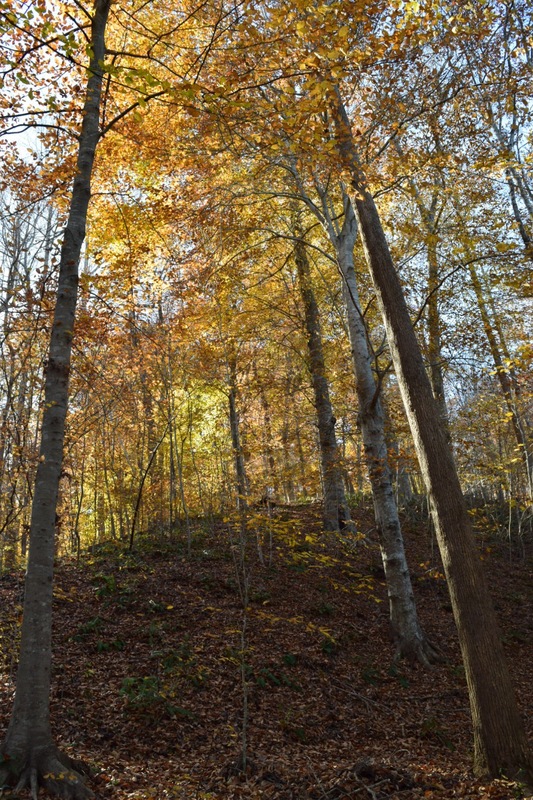 Here the trees were wearing golden brown leaves, while on the other bluff the leaves were bright yellow. I still don’t know why this phenomenon would occur, but you can bet I’ll be doing some research on it. We hiked all the trails at the park (about 3 miles worth), sometimes racing to stay ahead of noisy families, other times enjoying a rare human-free moment. I was impressed with the infrastructure and think it would be fun to return in the summer for a hope at a glimpse of the many salamander species that make this preserve home. Today was sunny and warm and we headed off to San Lee for a mountain bike ride. 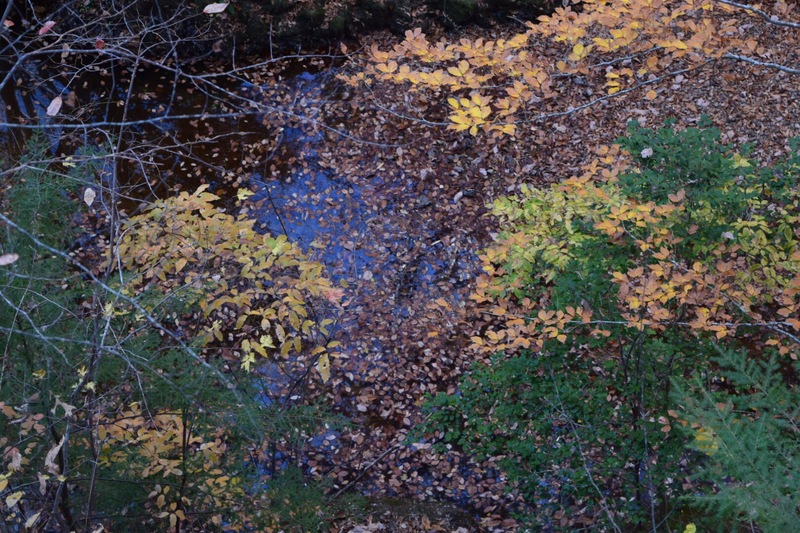 Another gorgeous day on a challenging terrain made a bit more treacherous by the coating of colorful leaves. 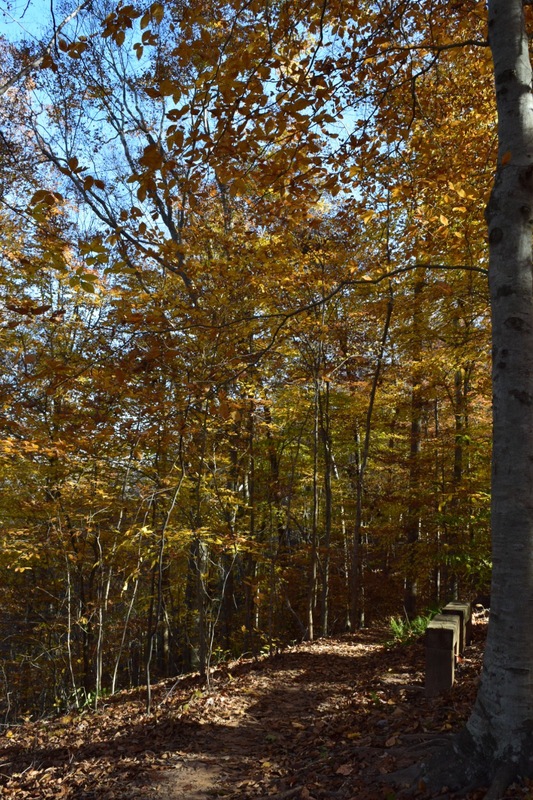 I’d recommend checking out all of these parks if you have some time to explore in the area of Cary and Sanford, North Carolina. 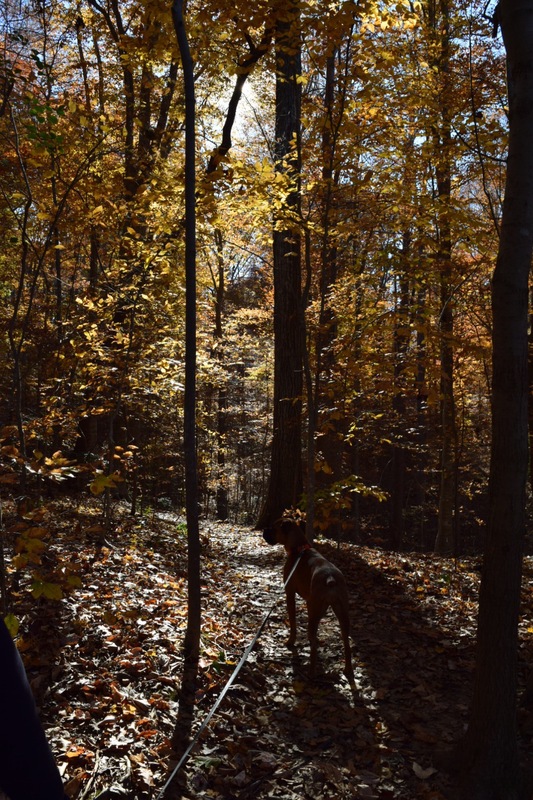 And if you didn’t do it this year, I’d encourage you to join us next year as we #optoutside! Wow this sounds so much better than Black Friday!! I’ve never participated in that. This year we were driving to Bishop. Not shopping😄 tomorrow we enter Mexico! There is not the crazy Christmas stuff in San Carlos.